Nintendo Experimented In The Late 1980s With What Odd NES Peripheral? Which Creature Can Hold Its Breath The Longest? In the 1980s, Nintendo released a variety of peripherals for their iconic Nintendo Entertainment System (NES). Most gamers will readily recall the more beloved ones like the Zapper Light Gun, Power Glove arm-mounted game controller, and R.O.B (Nintendo’s attempt at a gaming robot accessory). 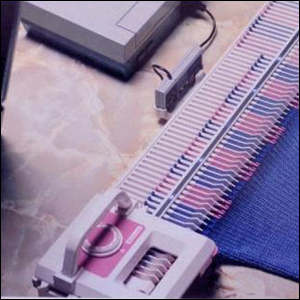 If you don’t recall Nintendo’s Knitting Machine peripheral, however, we can hardly blame you. Not only did the product not make it to mass market, but it was such a curious choice of peripheral expansion for a video game system that even guessing it existed is improbable. The basic premise of the device was that the NES would function as an 8-bit brain for the knitting machine, users would purchase cartridges that contained knitting patterns, and by feeding yarn into the electronic loom while it was connected to the NES the device would knit everything from scarves to sweaters. While the machine was a total flop when Nintendo pitched it to various toy stores and at electronics expos, the very premise of it, an electronic device that makes things, would do very well in the present with the whole maker movement, 3D printing, and general interest in such matters. In fact, when retired Nintendo video game producer and spokesman Howard Phillips posted pictures of an ad-copy for the device on social media sites back in 2012, the response was almost universally along the lines of, “Well, five year old me wouldn’t have wanted that back in the 1980s, but 30 year old me would buy it in a heartbeat now.” Clearly the Nintendo Knitting Machine was ahead of its time.